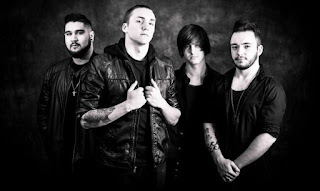 Heat Of Damage have already released a glimpse into their all new sound with the first single made video of the track "The Gift". This track coming off their upcoming sophomore release due out sometime in 2018! A few of the band members got together to talk about this single, brief info on the album's progress, and what's in-store for the band. David: The band began with Julian and I meeting in the 8th grade and using his garage to play covers of Metallica and other bands we were really into at that time. Nick joined us in our Freshman year of high school, and we started to play some gigs around Sacramento as a three-piece without a bass player. We finally found one, Jared, the summer before our Junior year in 2014, to complete our lineup. David: It definitely just came out like that. Julian and I liked it as a name for our two-person jam and it’s had staying power for us ever since. Nick: Tasty, yummy, saucy metal songs. 4. What is the story behind the track called "The Gift"? Nick: it started off as a song structure that Jared had written and presented to the rest of us. We then all took it and gave the Heat Of Damage sauce. 5. Can you tell me about the concept for the accompanying video for "The Gift"? Nick: The way I see it, it deals with the feeling in life of not knowing your place and trying to find where you belong. But it's important to us that the people that listen to our music think for themselves what it means to them. 6. You will be releasing your sophomore album next year, can you tell me a little bit about it? Nick: This new music is an incredible diverse and dynamic mix of slamming heavy music tracks that is a perfect representation of us progressing to new levels as musicians. 7. What can fans expect from the new Heat Of Damage album? Nick: You've never experienced metal ridiculousness like this. 8. How about plans for the rest of this year, what do you got lined-up? Nick: The rest of the year we're going to be gearing up for our album release and tour plans for 2018. We’re going to be entering 2018 ready to take over the world.